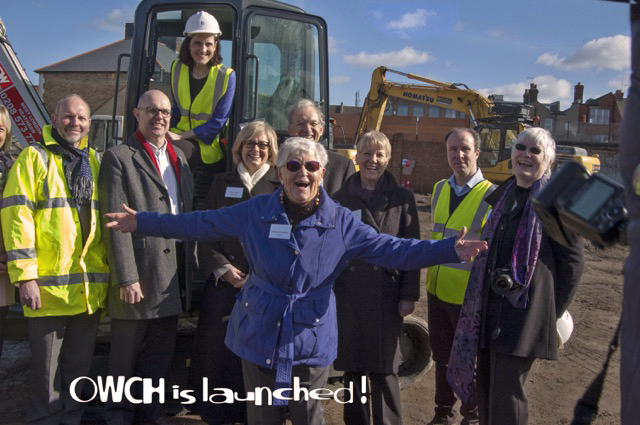 On February 26, the OWCH (Older Women’s Cohousing) project took its first step towards becoming ‘New Ground Cohousing’ in High Barnet. Based on the site of an old school two minutes from the town centre, the project will see a start to drainage system and foundations now that the old school buildings have finally been demolished. To mark this event, Theresa Villiers, Secretary of State for Northern Ireland and also MP for Chipping Barnet, womanfully ignored tight skirt and high heels to climb onto a digger for the press to take photographs and marked the occasion with a short speech celebrating the achievement of the OWCH group in getting this far. “championed the idea of interdependence rather than independence, self-supporting communities as an alternative to the more traditional forms of retirement housing and housing that positively reflects the hopes and desires we all have for our later lives. The New Ground housing scheme is the epitome of this and is a really interesting, innovative and exciting project. Hanover is delighted to play an integral role in this. Hanover is an organisation committed to listening to its residents and meeting their needs. The cohousing approach offers us a unique opportunity to learn through co-creation, so that we’re hearing and learning from future residents, right from the start of the project, in a way that really fosters increased innovation”. OWCH members will move in in February 2016. Their ‘Relocation’ task group is working on the transition and the next members’ workshop is on Decluttering.